The origin of flax appears to be in Egypt and surrounding countries as mummies were wrapped up by tissues of this material. - Herbaceous and annual species. - Its roots are shorts and have hallowed stems of about one meter high. The stems can be simple or branched and are characterized by their use in the textile industry. - The leaves are sessile, narrow and pointed, alternately arranged along the stem. - The flowers are solitary and are formed by 5 white or blue petals. - The fruit has a capsule form and it contains 10 seeds in dark and bright colour. The seeds are used for the production of flour as well as linseed oil. - Climate: It must be distinguished between fibre flax which prefers wet and mild climates and oleaginous flax that require temperate and warm climates. - Soil: The clay-siliceous soils are suitable for growing flax. If the soil is compact in nature which creates crust when it rains, seed germination is not possible. On the contrary, if it is loose and permeable, as flax roots are small, they will not reach well the deep layers. - Irrigation: The total water needs can rise to 400-450l/m2 throughout the cycle. "Grain flax" is very sensitive to drought during six weeks from ten days before the first flower buds until fifteen days after the end of flowering. A lack of water during this period greatly affects the production yield, and can cause a loss of up to 30% of the harvest. In top dressing, when the first buds appear, it should be applied 60-70u N/ha. 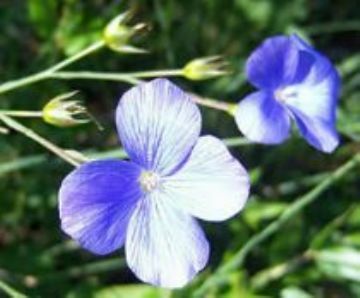 Flax is a plant that responds well and it is enhanced by nitrogen input. Phosphoric fertilizers favour crop yield in quantity, both in fibre and linseed. Potassic fertilizers favour fibre quality. However, flax is not very demanding in phosphorus or potassium. Flax flea beetle: the best known are Aptonia euphorbiae and Longitarsu parvulus. Adults become active in spring time, feeding on leaves and stems. Thrips sp. : there are two, one which is specific for flax (Thrips lini) and other which is generic for all cereals (Thrips angusticeps).